How to copy CD to iPhone without iTunes? As we know, iTunes can help us transfer CD music to iPhone, but it needs two steps to finish it. We need to add CD to iTunes, and then connect iPhone and sync with iTunes. Many people may become frustrated with the long load times and exorbitant hard drive space requirements of the iTunes program. Now, Xilisoft iPhone Magic Platinum can help you convert the CD to iPhone with one-click. 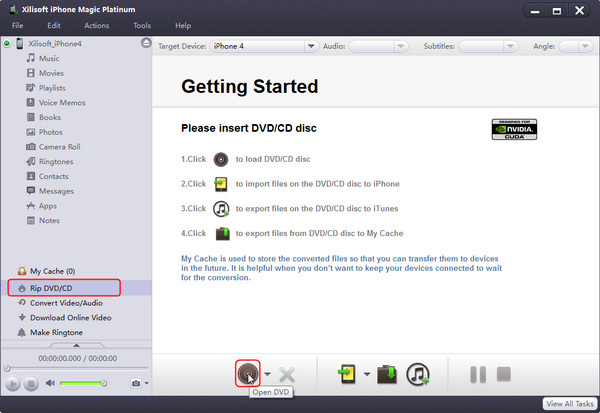 The program not only can help you to put DVD/CD to iPhone directly with one step, but also can help you to make ringtone and backup files between computer and iPhone/iPod. This article will show you how to copy CD to iPhone at one click. Guide: How to convert CD to iPhone? 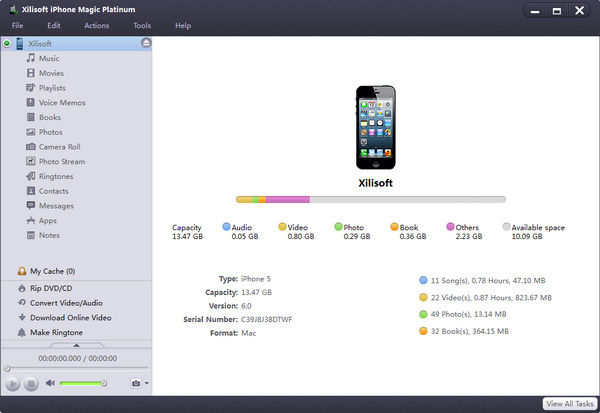 Step 1: First, free download Xilisoft iPhone Magic Platinum, install and run it. Connect your iPod/iPhone to computer, the application will recognize the device automatically and displays the device information in the interface. Step 2: Convert and transfer CD and DVD movie to iPod/iPhone. The program helps you put your loved CD and DVD movie into iPod/iPhone by converting CD and DVD and transferring to iPod/iPhone. 1. Select “Convert DVD/CD” node from the left directory tree, insert the CD or DVD disc you want to import, and click “Open DVD” drop-down button to load the inserted CD or DVD disc. After loading, all music songs or DVD titles will be displayed in the right file list. (1) Besides DVD disc, you can also load ISO/IFO files and DVD/CD folder from the “Open DVD” drop-down list. (2) In the right file list, right click the wanted DVD title, choose “Open” option from the right-click menu to preview it in the built-in player at the left bottom of the main window. Click “Display Player” can resize the small window to larger size. 2. Check the CD/DVD titles you want to transfer in the file list, and click “Copy File(s) to Device” button to start copying. Tip: If you connect more than one device simultaneously, then after clicking “Copy File(s) to Device” button, the “Select Copy Destination” dialog box will pop up to ask you to choose the target device(s) you need. How to make iPhone Text Tones?